I previously posted an excerpt from the stunning rheo: 5 from the youtube website. 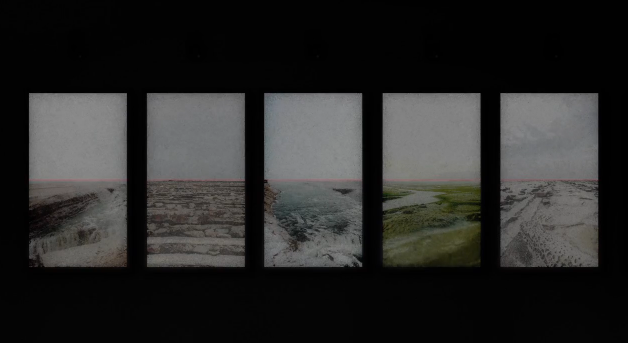 Ryoichi Kurokawa's vimeo channel is worth checking out and the wonderful rheo: 5 is on that. This is a beautiful work, and there is something about odd numbers. The arrangement into 5 screens is really interesting, it reminds me also of the earlier work Roy Lichtenstein's Three Landscapes - again an arrangement of an odd number of screens, this time 3, it also deals with horizon. I did a short blog post on my other blog - sounding visual blog on Roy Lichtenstein's Three Landscapes, recently reshown.